MA3 is plinthed at Margate Market and wearing unlined black livery in this view of 30 April 2003. 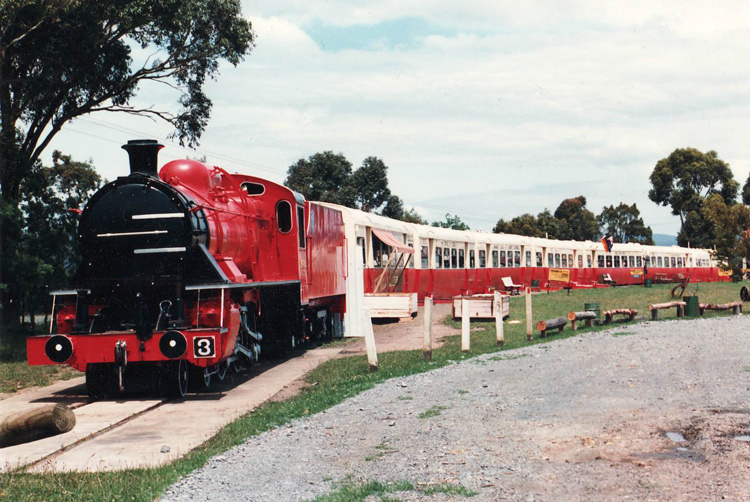 MA3 was originally numbered M6 prior to the Tasmanian Government Railways rebuilding of four "M" class members to "MA" class to make them better suited to freight work. 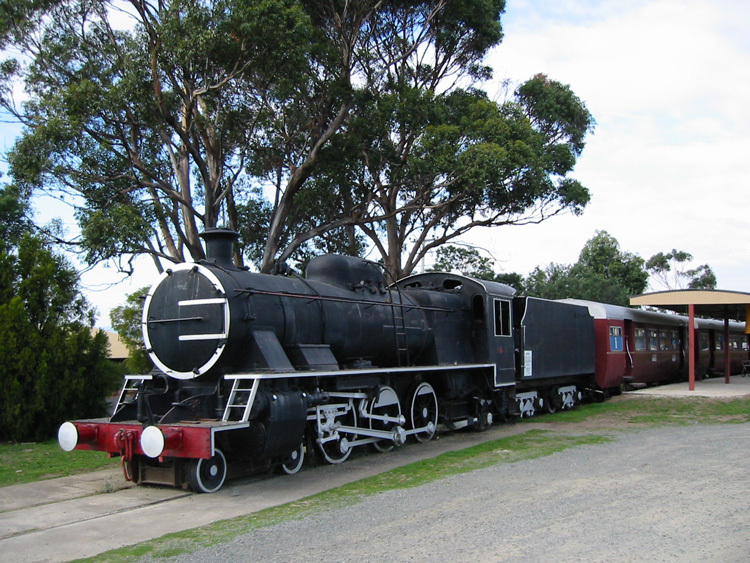 The modified engines were fitted with smaller diameter ex-Australian Standard Garratt (ASG) driving wheels and ex-B & C-class pony wheels. The weight distribution was also altered to place more weight on the driving wheels. New sandboxes for forward running were added on the footplate beside the smokebox, while the original sandbox in the dome was retained for reverse running. Locomotive MA1 was the trial conversion in 1957, while MA2 - 4 were the production conversions completed between 1957 and 1958. Rick Cook has provided this view of MA3 at Margate Market in November 1987. At that stage the loco was resplendent in its original and authentic Post Office Red livery. Comparison with the 2003 photo above shows that the "3" numberplate has since been removed. b L. Oberg, 'Locomotives of Australia', published by J. W. Books Pty Ltd, Brookvale NSW. 1982 reprint. c Cooper, G & Goss, G 'Tasmanian Railways 1871 - 1996, 125 Years - A Pictorial History' published by C G publishing Company. d Information provided by Melanie Dennis via email dated 14 July 2004.
e Webmaster's observation or comment.